Bittersweet, Forestino cacao, Ivory Coast. Repacaged. 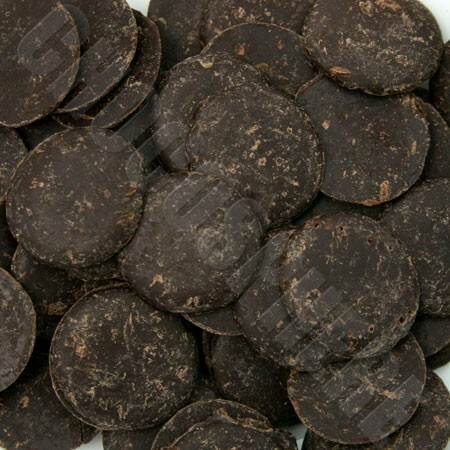 These Domori Organic 66% Cacao Mass bittersweet dark chocolate discs are excellent for use in recipes that call for delicious organic dark chocolate. This chocolate's taste is perfectly balanced with flavor notes of notes of coconut, hazelnut, bread crust and spices. The ingredient list is simple and pure: Organically-grown cacao mass and organically-grown cane sugar, organic cocoa butter and a very slight amount of soy lecithin. 1 Kg / 2.2 lb Net Wt., EU Organic Certification. Repackaged by Chocosphere. Domori's Organic project is about making fine chocolate with a recovered cacao variety they call "Forestino", from the Ivory Coast. The cocoa selected by Domori for this project comes from the Scay Cooperative, in the area between the villages of Toumodi, Oulaidon, Taabo and Lilebe, not far from the seashore. Most of the plantations in this area are smaller and grow the Forastino (or French) cacao variety created in the early 20th century as a hybrid of the Brazilian Amelonado and the Guaiana from French Guaiana. Some plantations even preserve and harvest traces of pure Guaiana varieties. The plantations in the cooperative are organic certified by the Scay Cooperative, supervised by Estelle Konan whose name has been given to this line of Domori organic chocolate. Estelle has been dedicated to the organic trade for many years and she has gained much experience by working with French NGOs that are well established in the Ivory Coast. Only natural methods are used by cooperative members in growing their cacao. The cooperative verifies that all cocoa producers comply with these practices and it supports them with specific training and workshops. Because of long-term supply agreements and an agreement to provide premium quality cacao, the cooperative will be able to invest in the improvement of services and infrastructure in the neighboring towns.